Betrayal. Adultery. Murder. Kingship. With a past that haunted him and a nation to rule, King David was still able to overcome his mistakes, even though it seemed impossible. Despite his character faults and trying years, he realized that God could still love him. If God can use someone like David to make a difference, God can use you too! Please note - This book is currently out of stock. We will deliver it to you as soon as we possibly can. Please allow an additional 2 weeks for delivery. We are very sorry for the inconvenience caused. In Andrew’s Lessons from David teaching, discover how turning to God can help you avoid many of life’s mistakes. Whether you are worried about the future or regretting the past, God has solutions to put you back on top. This resource will give you God’s answers to becoming a champion and a king. Journey through the ups and downs of David’s life and learn how you can move forward in success, even when it seems too late. 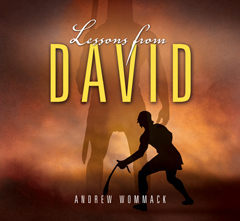 Thanks to the generosity of our Partners, we are delighted to be able to offer you a free copy of the Lessons From David book (limited to one free copy per household). To claim your free copy, please click on the "Order Now" button to the right and add the book to your Shopping Cart. In the Cart, please enter the Discount Code 2ACB. Please note: our usual shipping charges apply. Please note, this offer expired on the 9th November 2018. 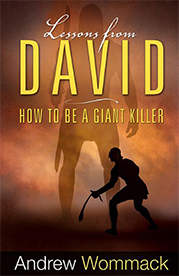 If you think you have made too many mistakes, that God could never use you, Lessons From David is for you! If God can use someone like David, God can use you too! This encouraging teaching will tell you how to move past your failures and into the incredible destiny that God has for your life!